If you’re looking for safety and portability you will love the PetSafe PIF-300 Wireless Fence. With the PetSafe PIF-300 Wireless Fence a constant radio signal will be used to create what is known as a stay zone. The stay zone can be a maximum of 180 ft in diameter and a minimum of 10 ft in diameter. This gives your dog plenty of room to roam around and have a good time. Anytime your pet ventures outside of the designated stay zone a simple single will be sent to the dogs collar. There will first be an alert and then a correction. This mild correction will let your pet know they are somewhere they shouldn’t be. The waterproof collar comes with 5 adjustable settings giving you the ability to customize how much reinforcement your pet receives. There is also a tone only mode for dog owners who would prefer not to use an electric stimulation when correcting the dog. For the safety of your dog there is an automatic safety shut off. After 30 seconds correction will automatically stop. The system will also shut off the Collar Containment Area in the event of a power outage. If you need to expand the stay zone you can combine the PetSafe PIF-300 with additional transmitters. This system allows you to add an unlimited number of pets by investing in additional collars. The PetSafe PIF-300 is a completely wireless system. There are no wires that need to be buried and no poles that need to be set up. The instant installation feature makes set up quick and easy. 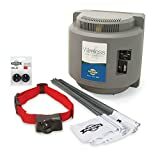 Most dog owners are able to have the system up and running in 2 hours or less. If you know how to plug in a cord you will have no problem installing the PetSafe PIF-300 Wireless Fence. The system comes with a training guide and 50 boundary flags to help you teach your dog his or her new boundaries as quickly as possible. Will you and your pet be travelling in the near future? No problem! The PetSafe PIF-300 Wireless Fence is completely portable and can be taken with you wherever you go. Just plug it into any power source and you will be able to keep your pet safe when you are away from home. ● Quick installation. Can usually be installed in less than 2 hours. ● Completely portable. Can be plugged up to any power source. ● 5 adjustable levels of correction giving you full control over the amount of stimulation your dog feels. ● Tone only mode for those who would prefer not to use electric stimulation. ● Waterproof receiver and collar making the system perfect for various weather conditions. ● Alert warning tone that lets you know when your dog is getting too close to the boundary. ● Automatic shut off for the correction signal which ensures your dog isn’t traumatized. ● Alert indicator that lets you know the collar battery needs to be recharged. ● Some users have reported the system giving static corrections even when the dog is within the stay zone. ● If you are around metal or electronic equipment the signal may be limited. Hills and slopes can also affect the strength of the signal. ● The shape of the field isn’t always consistent. This can cause gaps that make it easy for your dog to get through undetected. ● The boundary can sometimes change due to signal interference.